Geological disasters in the Three Gorge Dam areas have been brought under effective control but hazards such as landslides may still happen, Wang Xiaofeng, director of the Office of the Three Gorges Project Committee of the State Council, said Tuesday. As the water level will rise to 175 meters eventually in 2009 from the current 156 meters, the collapse of embankments will be unavoidable and may trigger more danger, Wang told a press conference held by the Press Office of the State Council. 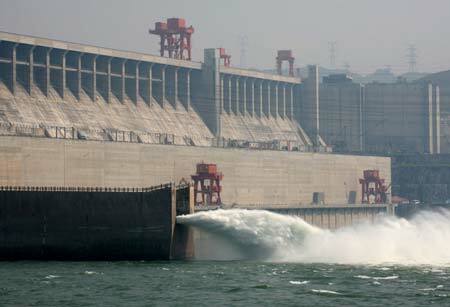 Describing the Three Gorges Dam area as "geologically vulnerable", he said the government had fully acknowledged the potential damages to local ecology long before the world's largest hydrological project was started in 1994. "I think we can minimize the damages and losses as the government will closely monitor local ecology and preserve environment," said Wang. Citing a feasibility report compiled in 1991, Wang reaffirmed that the negative geological impacts of the conservancy program were less than expected. "I am sure time will prove that the conclusions China made on the project were scientific," he said. Li Yong'an, general manager of the Three Gorges Project Development and Construction Corporation, backed him up by referring to the frequent landslides around the Yangtze River valley before the project began. More than 40 landslides had happened in the Three Gorges Dam area in the 1980s, with one worst case recorded in the Zigui County of Hubei Province, resulting in a 12-day suspension of shipping services on the Yangtze River, he said. "Since the water level rose from 60 meters in 2003 to the current 156 meters, no major loss of life or injuries have been caused by any major geological disasters in the Three Gorges Dam area," said Li Yong'an. More than 12 billion yuan ($1.62 billion) has so far been invested by the central government in the preservation of local geology. A new plan, whose costs are yet to be disclosed, will be implemented on a pilot basis to further optimize local ecology including protecting the sources of drinkable water, urban and rural pollutant reduction and tree planting, said Li.